Each layer, each cell of this venerable monument, your body, is a delicate tissue that must be pampered. 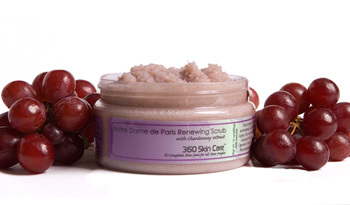 Let 360 Skin Cares’s Notre Dame de Paris Renewing Scrub; restore youth and radiance to aged, dry and neglected skin. Antioxidants found in Chardonnay extract wage a crusade against free radicals that can damage skin and accelerate the aging process. Our unique formula softens and protects the skin while transforming into a moisturizing lotion. Crammed full of wholesome ingredients, this exfoliating moisturizer is sure to rejuvenate your skin while leaving it feeling soft, smooth, and silky.